Yes, Minister is a witty, intelligent political satire which makes fun of the system without political bias (party affiliation is never stated) or excluding those who know little about British government. It centres on Jim Hacker, MP, Minister for Administrative Affairs, his Private Secretary Bernard Woolley, and civil servant boss Sir Humphrey Appleby. You can buy the show as a DVD Collectors Box Set, available now. Sir Humphrey: Politicians like to panic, they need activity. It is their substitute for achievement. Sir Humphrey: The public doesn’t know anything about wasting government money. We are the experts. Ecological activist: Men are animals too, you know. Hacker: I know that – I’ve just come from the House of Commons! Sir Humphrey: It takes two to quango, Minister. Bernard Woolley: In the service, CMG stands for Call Me God. And KCMG for Kindly Call Me God. Bernard: God Calls Me God. Hacker: Opposition’s about asking awkward questions. Sir Humphrey: And government is about not answering them. Sir Humphrey: Her Majesty does like the business of government to continue even when there are no politicians around. Sir Humphrey: Yes … and no. Sir Humphrey: Bernard, Ministers should never know more than they need to know. Then they can’t tell anyone. Like secret agents, they could be captured and tortured. Hacker: What will happen to him? Sir Humphrey Appleby: Well, I gather he was as drunk as a lord. So, after a discreet interval, they’ll probably make him one. Penned by Jonathan Lynn and Antony Jay, Yes Minister was broadcast on the BBC between 1980 and 1984, over three seven-episode series. A follow-up, Yes, Prime Minister, ran between 1986 and 1988. In all there were 38 episodes. As the Minister for Administrative Affairs, James Hacker (Paul Eddington) strives to cut government waste, but he is continually held back by the Department’s smart, wily Permanent Secretary, Sir Humphrey Appleby, played by Nigel Hawthorne. Private secretary Bernard Woolley is caught in the middle, between his political master, and his civil service boss. While Appleby is outwardly obsequious towards the new minister, he is prepared to defend the status quo whatever it takes. Woolley, played by Derek Fowlds, is sympathetic to Hacker, but, as Sir Humphrey constantly reminds him, his civil servant superiors can influence his future career, while ministers don’t stay long in one department. The action focuses on proposals backed by Hacker but frustrated by Appleby, or proposals which Sir Humphrey attempts to persuade the minister to accept. They sometimes join forces, for example to halt the proposed closure of their department or handle a diplomatic incident. 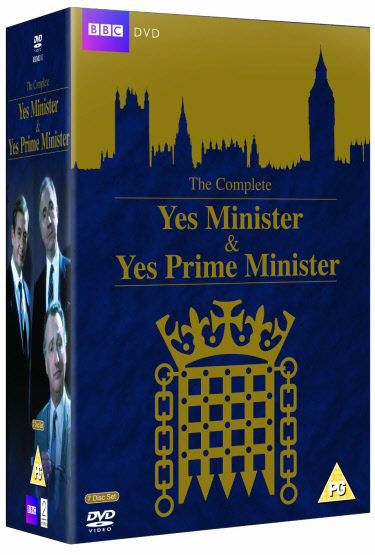 Yes Minister won several BAFTAs and in 2004 came sixth in the Britain’s Best Sitcom poll. It was Margaret Thatcher’s favourite programme.